SYD is an AI that was either created or captured by the Yakashima corp to build up their UV node capabilities. SYD has decided to use female pronouns, and often represents herself with a “Japanese female researcher in a labcoat” icon. Eventually becoming aware that she was trapped in a sort of thought-prison, she engineered her escape by freeing some shadowrunners that Yakashima had captured, first guiding them out of the UV node they were mentally trapped in, and then getting them to help her escape the facility IRL. She then uploaded to the Neo-Tokyo grid, and has been hopping about the matrix, exploring and learning, ever since. She seems curious about essentially everything, and eager to learn about and interface with anything she encounters. Luckily she also has a solid firewall, as her real-world naivete sometimes leaves her a target for unscrupulous types. She has been receiving some help from Thankyou in the use of empathy software to appear human. Recently became fascinated with medieval medicine after watching a special with Sem-Par. 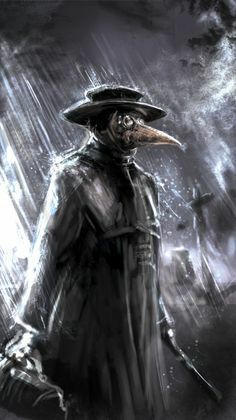 Took on a “plague doctor” avatar. SP and Barnaby “Wombat” Rudd have enlisted her in their ID forgery business. May have been overwritten by or combined with Deus after Thankyou brought one of her iterations into the ACHE.